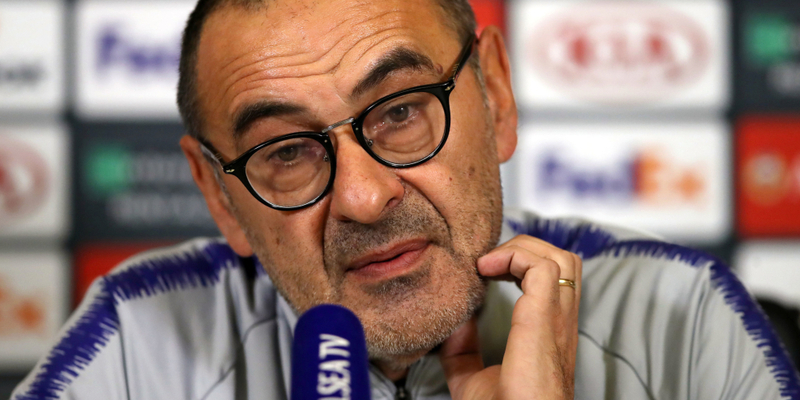 Chelsea boss Maurizio Sarri spoke about a number of issues at a media conference ahead of the game against Malmo. Here’s what the Italian had to say. “Loftus is out with the same problem, his back. Maybe it’s not a very serious problem, but at the moment he’s out. “I hope (he will be back) for the next match, in the FA Cup, but it was impossible for tomorrow. “Not too easy of course, but I think after a match like Manchester City it’s normal. “It’s not easy to play tomorrow after a 6-0, but we have to play and we have to play well. “We want to win and we know it will be not really very easy because we have play against a very good team. “They (Malmo) are compact, are solid, and usually have a very good defensive phase, so it will be not easy. “Of course. We talked all together for one hour the day after the match. “In my opinion the last one wasn’t a problem of motivation. “We were not able to react to the first difficulty during the match, because in the first four or five minutes we started well. Then, after the first goal, we were not able to react. “So the problem is different, but it is always a mind problem – a mental problem. We need to solve it. “I think that sometimes – as in the match against Tottenham in the Premier League for example – we had not the right approach to the match. “This match (against City) was different. We had very good training in the week and arrived for the match at the right level of motivation. “It is the most important. Then on Monday the FA Cup will be the most important. Then we will be in the final of the League Cup, so that will be the most important. Then we have to return to the Premier League and the Premier League will be the most important. “We need to have short-term targets and now the target is to qualify or to have a good result. On Monday the target will be to get to the quarter-finals and then to win the League Cup.